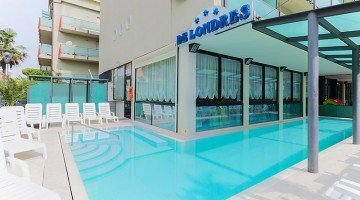 Hotel De Londres is a modern 3-star family-run hotel in Riccione, offering its guests a heated swimming pool, free WI-FI and free entry to the Beach Village water park. Accept small and medium-sized animals. The hotel is located in Alba, the northern area of Riccione, convenient to reach all the main points of interest in the city, on foot or by bike; The beach is just steps away and can be reached on foot. Next to the hotel is Viale Dante, while the local area of the Marano area can be reached with a 10-minute walk. The rooms offer modern interiors and have a balcony (sea view on request), air conditioning, free WI-FI, latest generation LED TV with digital terrestrial, direct dial telephone, safe, private bathroom with shower and hairdryer, minibar on request. Outdoor heated pool with hydromassage, terrace, free use of bicycles, newspapers in the lobby and lift. The hotel organizes theme nights and offers daily free entry to the Beach Village water park. PARKING: uncovered and free at 800 m, or multi-storey pay garage at 100 m.
AIR CONDITIONING: available in all environments. CONVENTIONS: beach, amusement parks, discos, law enforcement conventions, waterslide and free water park. BREAKFAST: served every morning buffet with both sweet and savory products. LUNCH AND DINNER: with every meal meat, fish and typical Romagna dishes cooked according to tradition, the menus vary every day and all meals are followed by a buffet of vegetables and appetizers. OTHER: every Sunday a rich buffet is set up. In hotel: children's pool, outdoor playground area, strollers, pediatric counseling. At meals: high chairs, bottle warmers, baby food and baby menu on request. On the beach: live entertainment, dedicated playground area. The heated swimming pool is located outside the structure, surrounded by a solarium with deck chairs, is available to all guests. Ideal for adults and children, it is also equipped with a hydromassage corner. The structure has an agreement with the Bagni Alfredo beach n. 111, equipped with sunbeds and beach umbrella (free for those staying in All Inclusive), children's playground area, fitness area and relaxation area. Tourist tax: not included: € 1,80 per day (only for the first 7 days) and per person from 14 years onwards. - 1st Child 0-2 years FREE * 100% (excluding period between 10/08-23/08). *4 guests sharing the same room = 3 fees (excluding period between 10/08-23/08). In case of early departure, a fee equal to the price of three nights will be calculated. Meals that are not consumed at the hotel will not be deducted from the full-board price. From 25 May to 10 June: Children up to 12 years stay free (only if accompanied by 2 adults for a minimum stay of 7 days). Easter at the beach in Riccione: live in the summer in advance! 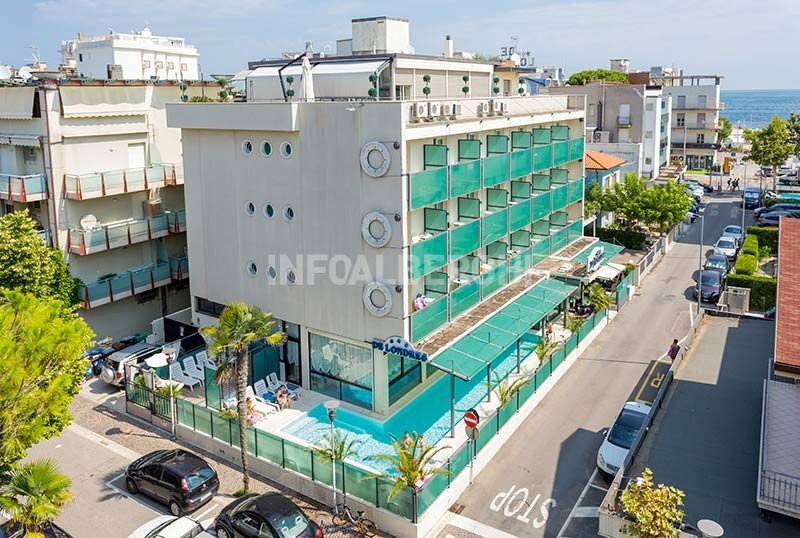 Here you are just 50 meters from the beach, centrally located at the corner with Viale Dante. Spring bridges to the sea: children pay half! MAY TO THE SEA WITH CHILDREN FREE! June offer in Riccione: the sea is a stone's throw away! From 3 to 28 June: 7 days in full board with water and wine at table for only 63.00 per person per day - Family travel? Special Week July-August in Riccione!